The PBE has been updated with a very large patch! First up, Gnar, our latest transforming and prehistoric champion, is now on the PBE for testing. Joining him is three new skins : Dino Gnar, Riot Kayle, and Arcade Miss Fortune. You'll also find a few balance changes, more mention of Ascension, and more! After his reveal earlier today, Gnar, our prehistoric, transforming new champion is now on the PBE for testing! Gnar throws his boomerang and watches it fly around for his recall. Mega Gnar - what Gnar morphs into when his fury bar fills! 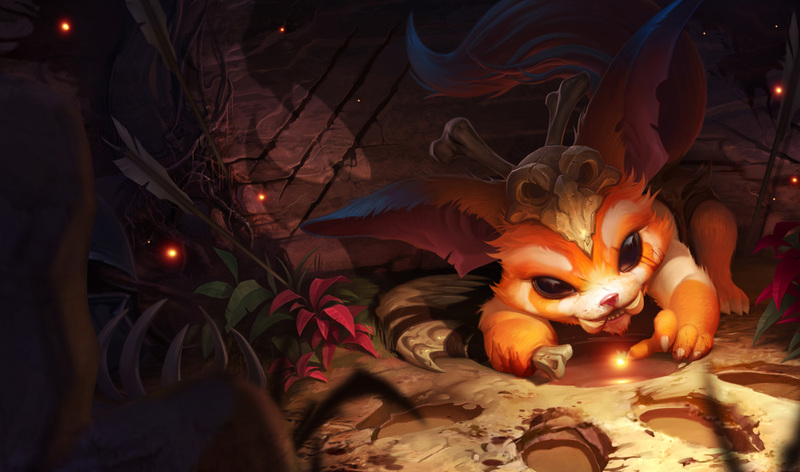 Gnar generates Fury while in combat and whenever he attacks. At max Fury his next ability will cause him to transform, modifying his abilities and stats for 15 seconds. size comparison between mini and Mega Gnar! Small Gnar: Throws a boomerang that deals 10/45/80/115/150 ( +1.0 Total AD ) physical damage and slows movement speed by 15/20/25/30/35% for 2 seconds before returning towards Gnar. Enemies hit beyond the first take 50% damage. Big Gnar : Throws a boulder that stops when it hits an enemy, slowing all nearby enemies and dealing 10/50/90/130/170 ( + 1.15 Total AD ) physical damage. Notice the line to denote the boomerang's return path! It goes about double the distance back. 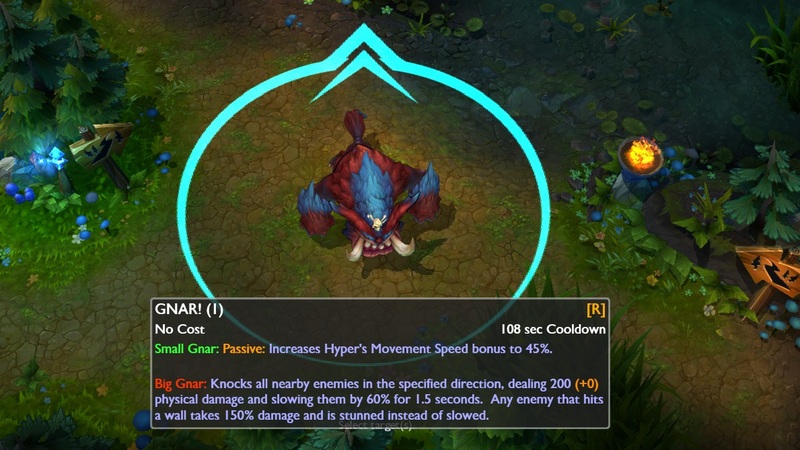 Small Gnar: Every 3rd attack or spell on the same target deals an additional 25/30/35/40/45 ( +1.0 AP ) + 6/8/10/12/14% of the target's max health as magic damage and grants Gnar 30% [ scales on ult ] movement speed that decays over 3 seconds (Max 70/125/175/225/275 damage vs monsters). Gnar gains Hyper's speed bonus whenever he turns from Big to Small. Big Gnar : Stuns enemies in an area for 1.25 seconds, dealing 25/50/75/100/125 ( + 1.0 Total AD ) physical damage. Big Gnar : Leaps to a location and deals 20/60/100/140/180 (+ 6% of Gnar's Max Health) physical damage to all nearby enemies on landing. Enemies Gnar lands directly on top of are slowed briefly. but if you E on top of someone, you will do a little roll and bounce farther! Big Gnar : Knocks all nearby enemies in the specified direction [500 units] , dealing 200/300/400 ( .5 bonus AD ) physical damage and slowing them by 60% for 1.5/1.75/2 seconds. Any enemy that hits a wall takes 150% damage and is stunned instead of slowed. 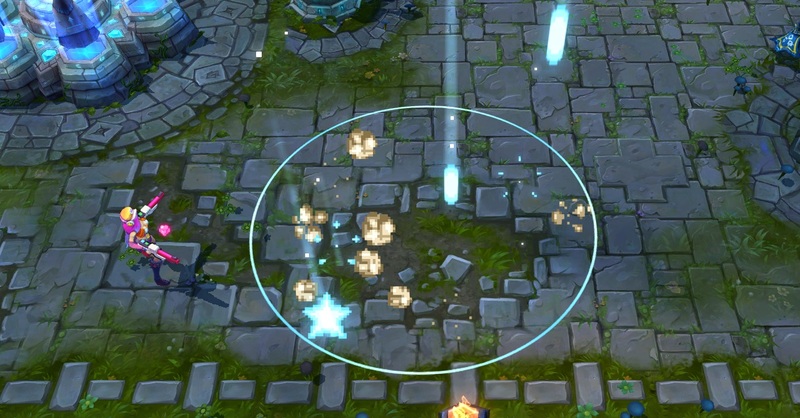 and here are all of Gnar's abilities in action! "The jungle does not forgive blindness. Every broken branch tells a story. I've made a terrible mistake." Gnar's release skin is Dino Gnar but he is unfortunately incomplete and missing his Mega Gnar model. Still cute though! Big Gnar is now literally a dinosaur! New recall animations! One on small Gnar and one on big Gnar! Your feedback and bug reports are extremely helpful to us, so please check out Dino Gnar and let us know what you think! Feel free to drop any bugs you find in this thread as well, and definitely give him a go on the Summoner’s Rift Update! NOTE: Hey summoners, we regret to inform you that Dino Gnar won't be playable on the PBE today 7/29/2014. We encountered a game breaking bug on his skin early this morning. We are working to resolve this issue as quickly as possible! Thanks for your patience!" He stacks up his LOL blocks and smashes them down for his recall. The different stages of Gnar's fury meter charging. Here is an incomplete teaser, though we'll be sure to update you when he is fixed up! In addition to Gnar, this update features two new skins - Arcade Miss Fortune and Riot Kayle! 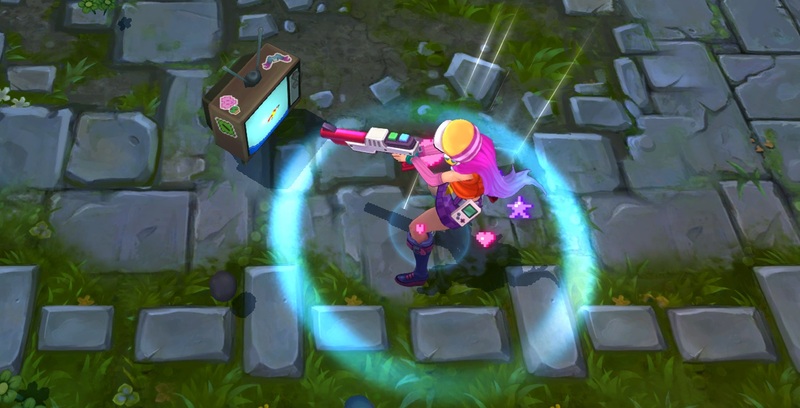 "Straight out of an oldschool arcade, Arcade Miss Fortune is ready to share her love for pixels on the PBE! Now let's take a better look! 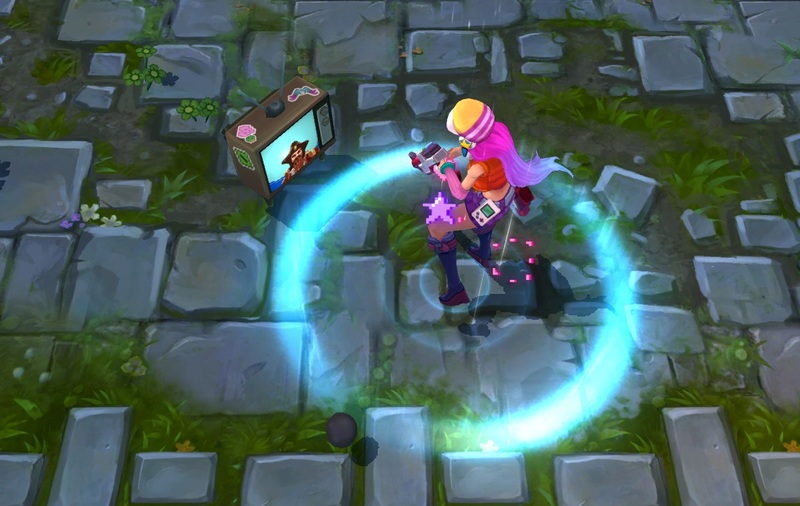 For her recall, Arcade MF spawns a TV and plays something like duck hunt! "We've got eyes in the sky! And the searchlights found YOU! 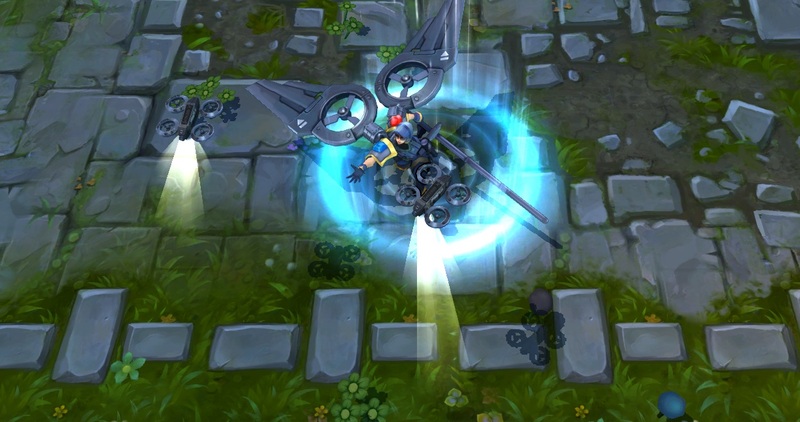 Riot Kayle has geared up and upgraded herself to provide air support on the Fields on Justice! With her hovercraft technology, she's ready to join in the PBE ranks along with her friends! Her Recall summons little drones! 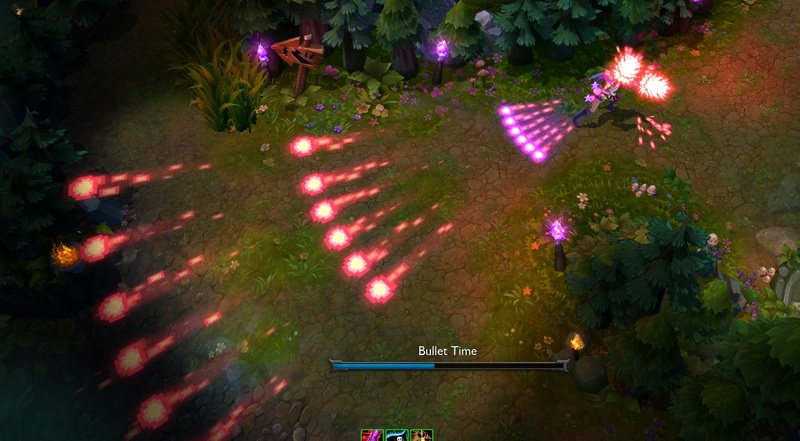 Summoner's Rift Update sort of back. The files for the Summoner's Rift update are back but the map itself is not yet accessible at the moment ( at least by way of custom games ). More Ascension files popped up in today's update, most notably recommended items for each characters. For those who might not be familiar with "Ascension", it is a name referenced to by multiple files over the last few PBE updates. No confirmation on what it is or isn't yet but several of the files have dealth with Map8 which is Crystal Scar / Dominion. Attack speed per level increased to 2.5% from 2.2%. Active now lists it does damage and slows over 2.5 seconds, up from 2 seconds. 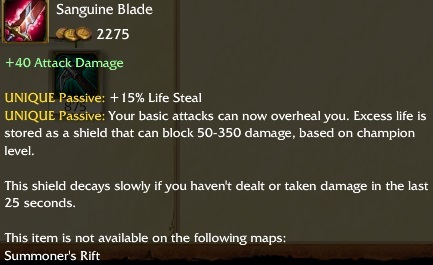 New Unique Passive: Your basic attacks can now overheal you. Excess life is stored as a shield that can block 50-350 damage, based on champion level. This shield decays slowly if you haven't dealth or taken damage in last 25 seconds.